The highly-accurate Near Infrared (NIR) fixed thermal imager produces high-resolution images for detailed temperature measurement. Four models measure ranges between 600 – 3000 °C (1112 – 5432 °F), with four field-of-view options and five close-up lenses. This flexibility is key to the NIR, with AMETEK Land’s advanced radiometric infrared technology delivering accurate process temperature data for a variety of applications, ensuring consistent product quality and enhanced process safety. The high-resolution, 324,000 pixel thermal imager transmits thermal data to a connected PC via a Gigabit Ethernet connection. Our advanced LIPS software provides flexible, application-specific thermal analysis, including live and timed image capture, and a variety of selectable display modes. The NIR offers a versatile, accurate and reliable solution for continuous temperature measurements for applications in the ceramics, industrial processing, heat treating and steel industries. Complemented by AMETEK Land’s extensive peripherals range, four models provide coverage across four temperature spans, with options of various field of view lenses. These choices make the highly detailed measurements of the NIR applicable to a wide variety of industrial and research applications. Among the many options available for the NIR are close-up lenses for small targets and a selection of protective housings to protect the imager against hostile industrial environments. Using these ensures ultimate measurement reliability and availability. For added confidence, the product has a two-year warranty. Land Image Processing Software (LIPS NIR) provides thermal analysis customised to your process. Control measurement parameters, capture images or video, set up alarms and change displays to get the best analysis and management of your system. 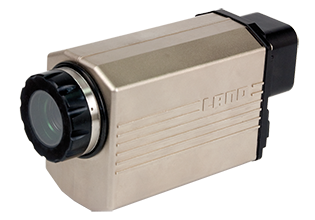 The NIR thermal camera is part of AMETEK Land’s integrated solution for accurate, flexible thermal imaging and temperature measurement.